Roy Sexton Likes My Book! Roy Sexton Likes My Book! My pleasure, Tom! Thanks for the kind words! 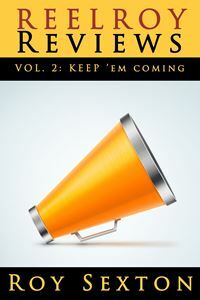 So Roy Sexton was already one of my favorite reviewers. Seriously. I’d put the guy up there with Nathan Rabin and Roger Ebert. Then it turns out he liked my book, which pretty much made my day, week and month. See the review here. Check out more of his wonderful reviews while you’re at his site, “Reel Roy Reviews.” Hell, just go ahead and buy one or both of his books. And please bear with me, folks. I’m riding an endorphin rush here. 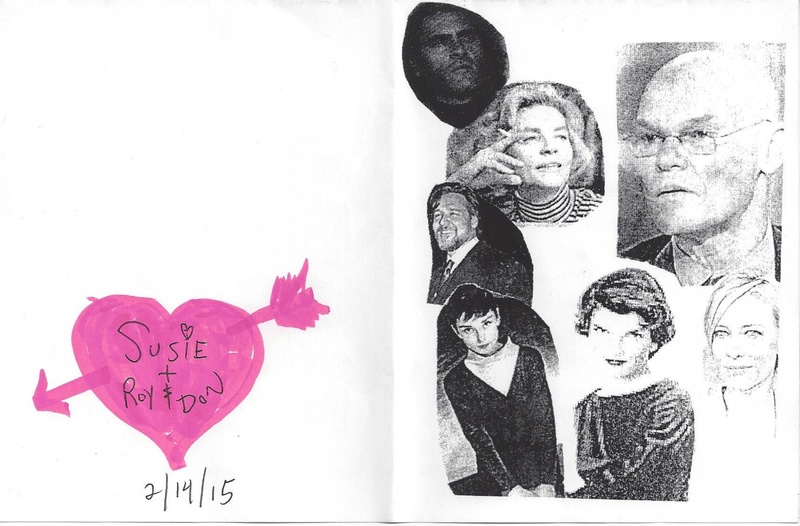 My talented mom Susie Duncan Sexton takes on the Joaquin Phoenix-narrated documentary Earthlings … enjoy! I watched the documentary EARTHLINGS which arrived from AUSTRALIA today, and now I’ll never be the same. I care even more than I did already about even-ing up the score on behalf of all of those species so much in need of help from the human species! 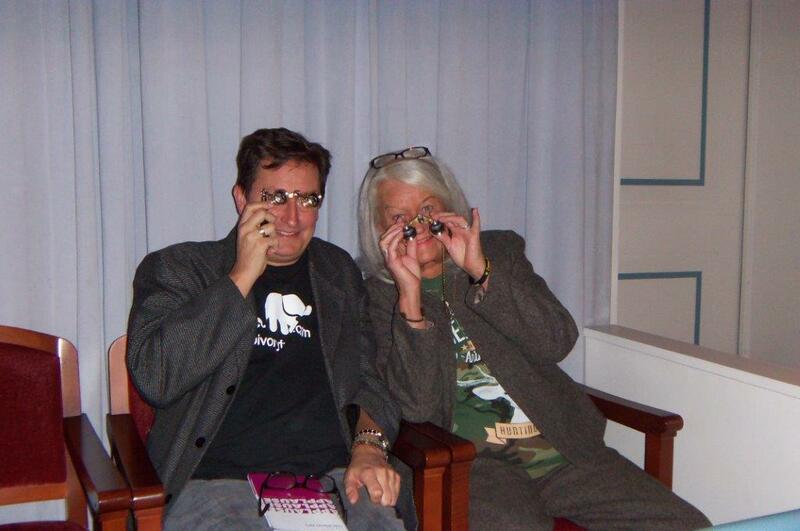 Thanks, Roy, for sending the film and for seeing to it that I got my eyes opened up even more than they are already! THIS DOCUMENTARY IS ABSOLUTELY AMAZING, and I highly recommend that the earthlings who call themselves/ourselves “humans” view this important film before any more time passes. You’ll rediscover your heart with this entry which should be required viewing. We must all change; we must all care; we must all stop the madness and the denial and make this world right. Now! I am still reeling from the importance of the film and am sorry that I waited so long to watch what all of us need to witness – young and old, the compassionate and the callous. I am totally disenchanted with the human race: why are people so insanely cruel, why has society failed to evolve? We should hang our heads in shame. We shall none of us be pleased with ourselves for allowing this disrespect for life to continue – as we advance into what must become the “civilized” 21st century – and for looking the other way and for failing to speak up no matter what the consequences of activist caring might be. Required viewing, especially for those who are young enough to attempt to reverse the damage humans have wrought, throughout the ages, due to ignorance and thoughtlessness and greed and certainly an insatiable appetite for unbridled cruelty. I highly recommend that we finally begin to educate young minds to seek to be kind. As they say, “a must see” – no more looking away. Our looking at/seeing/seeking the truth cannot compare to the pain and suffering we inflict upon every other species second by second by second. Enough…enough. No more denial from any one of us. P.S. 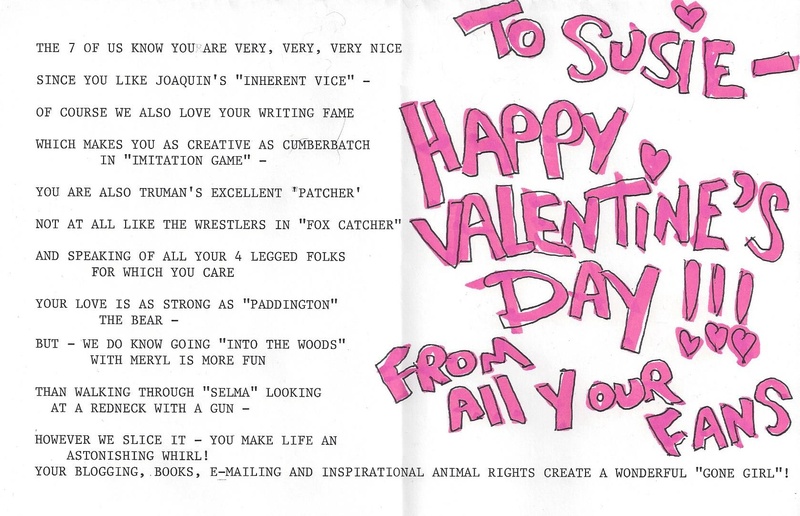 Enjoy the below Valentine (“Fifty Shades of … Nice”) made by my father Don and given to my mom today – movie themed and very sweet! I get asked this repeatedly when I see a movie based on a piece of literature (sometimes using that term very loosely), if I dare to have some issue with the film: its narrative structure, character choices, execution, blah, blah, blah. The questioner always seems to imply that my review is somehow thereby deficient, that I didn’t do my homework. This scrutiny arose when I found the Twilight movies a tedious bore, when I thought Hunger Games was overrated nonsense, when I dubbed Mortal Instruments insipid idiocy, when I felt American Sniper was dangerous propaganda, and when I perceived Wild to be self-aggrandizing tell-all myth-making. I didn’t read any of these uber-popular tomes – I only saw the film treatments. And I’m not going to read the books. Stop asking me. Please. Here’s the thing. I don’t want to have to read the book to understand and enjoy the movie. A good movie adaptation will anchor the narrative pulse points in a novel or biography and add visual flair to make the piece cinematic, comprehensible, and it’s own entity. Think Gone With the Wind, To Kill a Mockingbird, Willy Wonka and the Chocolate Factory, The Black Stallion, The Godfather, There Will Be Blood, No Country for Old Men, Foxcatcher. Hell, think Gone Girl. If it’s that imperative to read the book and see the movie to get the complete entertainment value, well, I just won’t. To me, that’s lazy film-making, and that’s coming from someone too lazy to read the books. So there. If Kurt Vonnegut and Janet Evanovich had a baby whose doting uncles were Raymond Carver, Stephen King, Ray Bradbury, and Mickey Spillane, that baby very well might be Tom Joyce. The Freak Foundation Operative’s Report relates the sordid and satirical tale of Batley, a small post-industrial town in Central Pennsylvania, a burg terrorized by a nasty group of thugs (“The Slain”) and populated with a carnival tent full of freaks and weirdos (and that’s just the City Council). The central mystery (and it’s a compelling one) is why this town has been targeted, who’s pulling the strings, and why. I won’t spoil any of the surprises, but the book is a zippy page-turner with just the right balance of mirth and mayhem to engage the most jaded of readers (me). Joyce employs a rotating cast of narrators, including a hard-boiled and hard-drinking gumshoe; a universally reviled local journalist (named, oddly enough, “Tom”); and assorted colorful characters, including, among others, a foul-mouthed little person who runs a road-side freak show, a confidence man who grows increasingly less confident in his choice of allies, and a huckster demonologist/psychologist with a heart of gold. Joyce has a great pulpy literary voice, informed with a cheeky sensibility, a knowing cynicism about the uniquely American ability to wave the flag while we stab each other in the back, and a genuine flair for marrying creeping crud, visceral thrills, and rich Mayberry-quirk characterization. This book is naturally cinematic in its execution, cable-ready for HBO or AMC or (likely) FX to develop a raw, ribald anthology series from the frothy material. The novel is composed of a series of journal entries, letters, documents, and reports (via the various narrators delineated above) offering the cumulative effect that we, as readers, are suddenly privy to a hotbed of small-town intrigue as the mystery unfolds through hearsay, redirects, and anecdotes (see Carrie, The Color Purple, or even The Sound and the Fury for other examples of this technique). This, coupled with Joyce’s pragmatic, glib, and witty writing style, makes for an adventurous reading experience – Hardy Boys/Nancy Drew for adults. 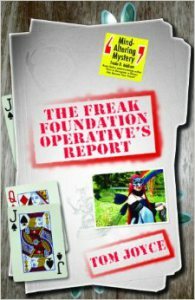 You can order at Tom Joyce’s The Freak Foundation Operative’s Report by visiting his free-wheeling blog here.